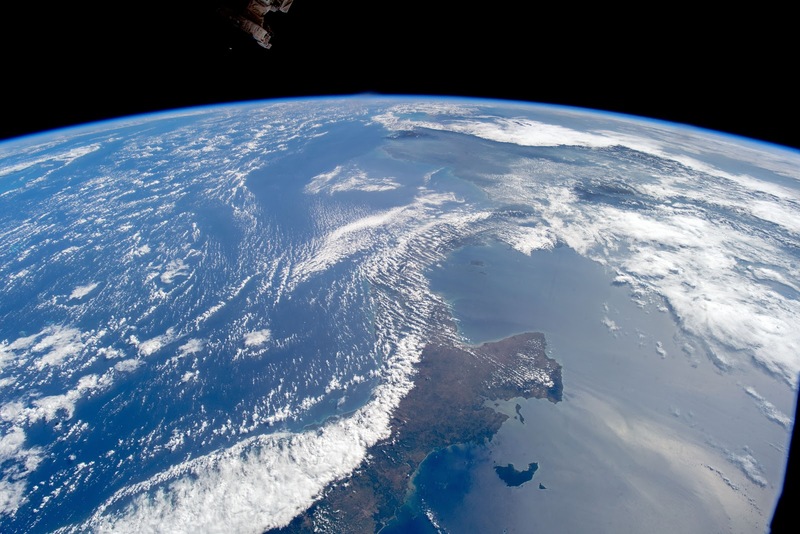 An astronaut aboard the International Space Station (ISS) focused a digital camera on the narrow strip of land that joins North and South America and divides the Caribbean Sea (left) from the Pacific Ocean (right). This view is close to what an astronaut sees from an ISS window because the short camera lens (24 millimeter) is similar in focal length of the human eye. 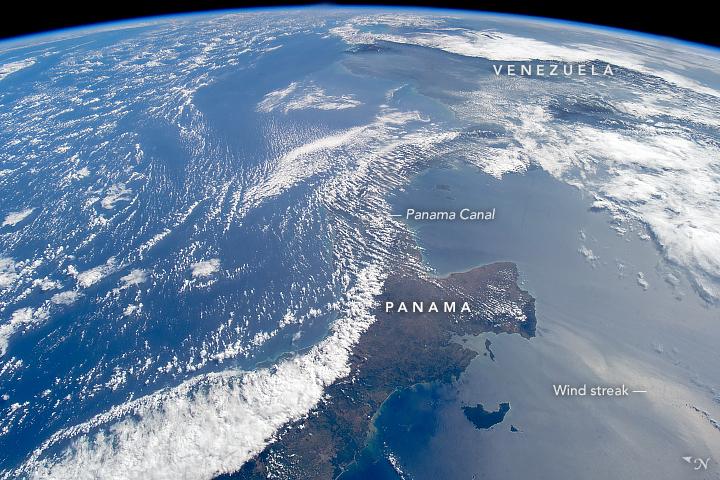 The narrow, winding strip of land at image center and lower left is Panama, with Venezuela under cloud cover at the top right. The narrowest point in the center of the photo (61 kilometers or 38 miles wide) is the location of the Panama Canal, though it is mostly obscured by clouds. The widespread cloud cover illustrates the effect of the dominant easterly winds that blow from the Caribbean and Atlantic Ocean year-round. Lines of fair-weather clouds on this day aligned themselves generally parallel to the wind direction. A different mass of thick clouds appears at the lower left, where mountains force the humid air to rise. As the air masses cool, they form clouds that deliver high rainfall totals to the “Caribbean slope” of Panama. In contrast, the air descends on the Pacific-facing slopes, leading to typically cloud-free skies and a hotter and drier climate. The wind also produces a visible cloud streak on the surface of the Pacific Ocean. The Panama land bridge between North and South America did not exist until 8.6 to 7.1 million years ago. Prior to that time, South America was effectively an island continent like modern Australia. The land bridge allowed the migration of animals between the continents in what is known to scientists as the GABI: the Great American Biotic Interchange. This slow but vast migration process changed the composition of animal communities on both continents. Astronaut photograph ISS054-E-44629 was acquired on February 13, 2018, with a Nikon D5 digital camera using a 24 millimeter lens and is provided by the ISS Crew Earth Observations Facility and the Earth Science and Remote Sensing Unit, Johnson Space Center. The image was taken by a member of the Expedition 54 crew. The image has been cropped and enhanced to improve contrast, and lens artifacts have been removed. The International Space Station Program supports the laboratory as part of the ISS National Lab to help astronauts take pictures of Earth that will be of the greatest value to scientists and the public.